I’ve set myself a challenge to use up all the meat in the freezer and then go veg for a month to see how it feels. 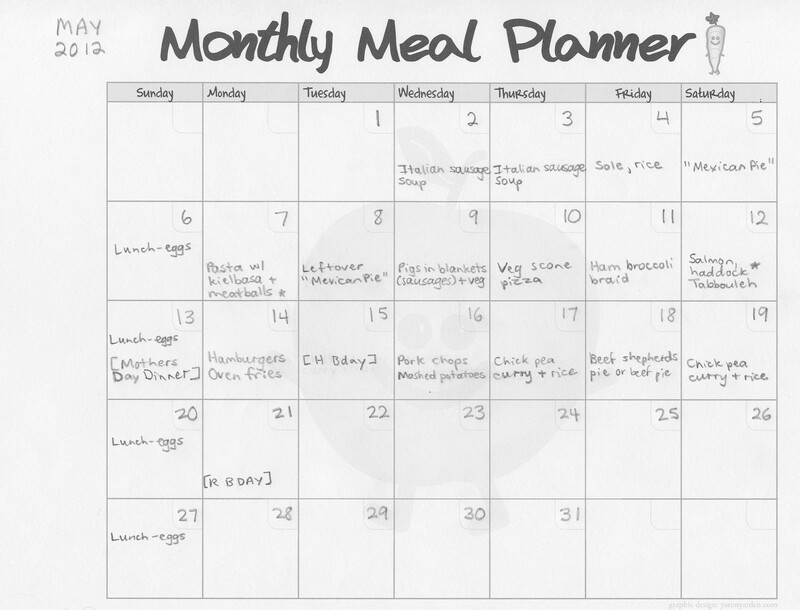 I usually do a menu plan a month at a time, but in order to use up all the meat in there, I’ve had to do a 7-week meal plan! That will cover April 1 to May 19. We usually only have sausages once a month so I have no idea if we can tolerate having sausages 9 times in 7 weeks, LOL! If not, we’ll have to give them away or extend the meat meals to the end of May! 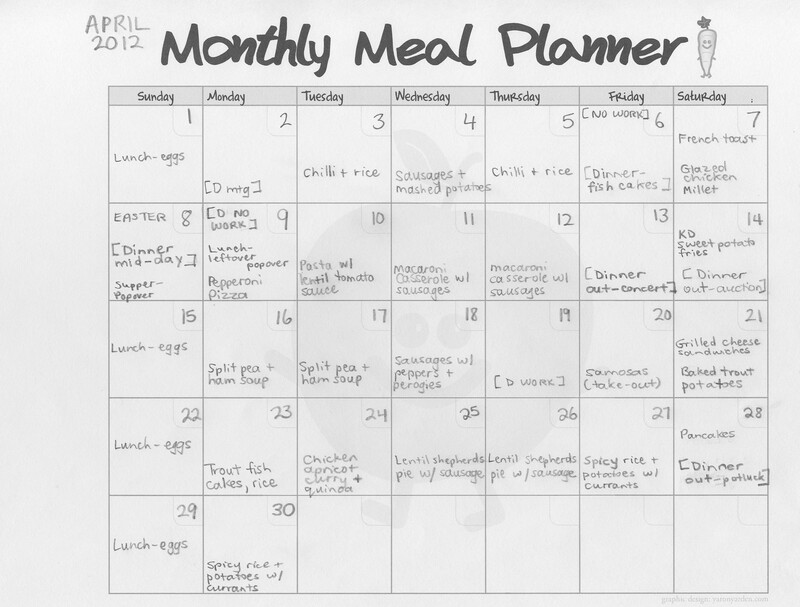 Meal Plan for April 2012 - never to be repeated! On Sundays Rom and I always have eggs for lunch, and we go to my parents’ place for dinner. The rest of the week, we pack our own lunches for work, and have dinner together at home. Any outside commitments are marked on the calendar – I work or have meetings occasional evenings – and we arrange our own dinners those days. There are lots of things going on in April: my mom traditionally makes fish cakes (from salt cod and potatoes) on Good Friday, and she does a big Easter meal for the extended family. We are going to a concert April 13 (Sarah Slean performing with the symphony, yes!) so will have dinner out after work. On the 14th, we won an auction to participate in a homemade Indian dinner for 8, yes! I have had a craving for samosas as well, so I scheduled them in later. And we are going to a potluck dinner at the end of the month, and only have to contribute a vegetable dish – easy! In May I will have everyone over for a Mothers Day dinner (North American Mothers Day on the 13th) – no, I won’t feed them sausages 🙂 For my nephew’s birthday, we usually go out for Chinese buffet. And I will take Rom out for his birthday wherever he wants to go. and you can bet I will be eating vegetarian lunches every single day! If you’ve ever been in this situation (using something up in a short period of time), I would welcome advice! Of course, I could always save some of the sausages for a month or two hence when we are tired of being vegetarian – but who knows, maybe we won’t be? Oh how I love menu planning. I also love getting the freezer cleaned out. Sometimes you just HAVE to do it. I only have an above the fridge freezer, so every inch of space has to be used. Have fun with your Sausage Extravaganza!